Short and sweet today, like me after my morning latte — bah! If you are feeling positively sugared out but you still have days of office baked goods and well-intentioned gift bags to go, I offer up this antidote: parmesan black-pepper biscotti. Oh, it’s indulgent but in a way that is precisely 180-degrees from the half of the coconut lemon bar I did not just scarf down. (It was homemade! From scratch! I have principles, you know.) Bright and sharp, accented with mini ka-pows of black pepper, it pairs so well with red wine, eating it without may leave you with a distinct Chianti-tinged longing. Or it would if you’re a wino like me. Please, take us both to a cocktail party, stat! A woman who makes more subversive, and therefore cooler, snowflakes than I, bowls me over with a therapeutic assortment of 26 cookies. My favorite is the note on the last one. “Long ago I learned that if I wanted to find recipes that fit a healthy lifestyle I did not need to turn to cookbooks so designated. They are often boring. They frequently include a formula that doesn’t interest me. Sometimes they are too rigid.” Marian Burros speaks my mind. Makes 5 to 6 dozen biscotti. Put oven racks in upper and lower thirds of oven and preheat oven to 350°F. Pulse peppercorns in grinder until coarsely ground. Whisk together flour, baking powder, salt, 2 cups cheese, and 1 tablespoon ground black pepper in a large bowl. Blend in butter with a pastry blender or your fingertips until mixture resembles coarse meal. Whisk 3 eggs with milk and add to flour mixture, stirring with a fork until a soft dough forms. Turn dough out onto a lightly floured surface and quarter dough. Using well-floured hands, form each piece into a slightly flattened 12-inch-long log (about 2 inches wide and 3/4 inch high). Transfer logs to 2 ungreased large baking sheets, arranging logs about 3 inches apart. Whisk remaining egg and brush some over logs, then sprinkle tops of logs evenly with remaining 1/4 cup cheese and 1/2 tablespoon ground pepper. Bake, rotating sheets 180 degrees and switching position of sheets halfway through baking, until logs are pale golden and firm, about 30 minutes total. Cool logs to warm on sheets on a rack, about 10 minutes. Carefully transfer 1 warm log to a cutting board and cut diagonally into 1/2-inch-thick slices with a serrated knife. Arrange slices, cut sides down, in 1 layer on a baking sheet. Repeat with remaining logs, transferring slices to sheets. Bake, turning over once, until golden and crisp, 35 to 45 minutes total. Cool biscotti on baking sheets on racks, about 15 minutes. Do ahead: Biscotti keep in an airtight container at room temperature 2 weeks. Wow- these look delicious! Even though some of my hordes of guests may scoff at the thought of drinking red wine in the heat of the Australian summer, I’m pretty sure these will be gobbled up! And to ensure the integrity of the recipie – I’ll have a glass of red to fortify me through the cooking process. Deb, those look awesome. Oh, today someone gave me a Rachael Ray casserole dish for Christmas. Now, I can and can not stand RR but this pot looks awesome. It’s heavy with deep sides and looks like it will be great for small batches of soup and stews. I’m excited to try out my new kitchen equip but I probably won’t open the box until after I move. I think you need to open a gourmet food shoppe, a la Barefoot Contessa. These look incredible. I did a post on these several days ago. Yes, these are really excellent!! Deb – What a terrific blog you have! I confess that I, too (despite my cynical leanings), have become seriously addicted to Smitten Kitchen, checking in with you every morning as I sip my first cup of coffee. Beautiful photos, great prosey style, links to places I’d never have found myself. You’re what makes the internet the greatest damn thing to happen to humanity since the printing press. Truly lovely, Deb. And very Italian and easy, just the perfect combination. Plus, I can think of 100 different things to add to the basic dough… this would be lovely with chopped confit tomatoes. IÃ‚Â´m gonna give them a try soon. ohh and bravo to that quote by Marian Burros, itÃ‚Â´s as if diets and formulas are designed for people who donÃ‚Â´t like food, donÃ‚Â´t like to cook and canÃ‚Â´t tell between something natural and something plastic without any flavor. Why is Joc in the hospital? Yes, I’m with you on the variations. I like the idea from Marce of the confit tomatoes above. I’m thinking sesame would be a natural addition. This is the perfect choice for my husband – he doesn’t like sweets (crazy, I know) and loves cheese. I’ll be making these, that’s for sure! mmm these look SO good. Anything that is better with wine is fine by me. Those look great. I made these last night, and my generally picky boyfriend, Wine Guy, said, “Wow! These smell great! These taste exactly how they are suppposed to taste!,” which, coming from him, is high praise. So, thank you for the recipe :)! Yum! Those look delicious. My mom makes a similar dish, but with oregano instead of black pepper. They are the perfect companion for a simple soup. I’ll have to try this recipe and see how it compares. thanks! Congratulation on getting into 9rules. You’re one of my favorite food bloggers. I saw this in Gourmet and totally wanted to make it! I’m glad it turned out so well for you. They look fantastic! Excellent recipe, this will go into my cookbook. I’ll be serving these with marinara sauce for Christmas Eve, and I’ll give you the credit you deserve! Merry Christmas! Okay, I just have to say, that when these come out of the oven still in “breadstick” form, before they’re sliced and made into the lovely biscotti, they are almost dead-on for consistency for those amazing garlic-paremsan biscuits they serve at Red Lobster. I’m going to experiment a bit with different cheese and maybe a bit of garlic, but this recipe is quite multi-purpose! Yummy, that’s my kind of biscuits, I love savoury bits! allthough I sell mostly sweet specialities. Recipe, posted to me this morning, from a very dear German friend of mine, I’ll be making them……….. TONITE!! Oh these look deeelish. Going to make them tonight to go with my homemade creamy tomato soup. Great site, love the recipes and fabulous photos. Most delicious! I am doing them right now and will take them with hummus as a small “Mitbringsel” for the birthday party of a good friend. Thanks for the recipe! I am sure it’s going to be a huge hit this evening. I made these biscotti yesterday afternoon so my boyfriend and I will have an easy breakfast to grab before running out the door this week. I decided to amp up the flavor a bit and add garlic. They seemed to take longer to cook than the recipe suggested, but perhaps my over is a bit slower. They are delicious and addictive! I made these today and am sipping some Pinot and nibbling on one of these as I review them here. I love these. You were so right about them being perfect with a glass of wine. The pepper leaves just a nice warmth in the aftermath making them perfect to accompany alone with a good hearty red wine. They were simple (a big biscuit, really), easy to slice and have outstanding flavor and texture. Thanks again..it will be great to have available over the holidays. these are delish. i made them to accompany the pumpkin black bean soup. my kids really liked them. absolutely wonderful. Just made these– must say they were a HIT. And, I definitely accidentally put too much Parm (is there such a thing??) but wow were they amazing. My roommates, who generally only eat Lean Cuisine and Light Soup, have eaten so many of these I’m afraid I won’t have any for the week. Paired with my Nonny’s simple but delish lentil/sausage soup and wow. Yum. I made these as a pre-dinner nibble when the in-laws came for Easter and they were a hit – my sister-in-law couldn’t believe they weren’t shop bought! I’ll definitely be making them again. One question remains, though… my almond biscotti are hard as rocks, and in my opinion they should be, as you’re supposed to dunk them. 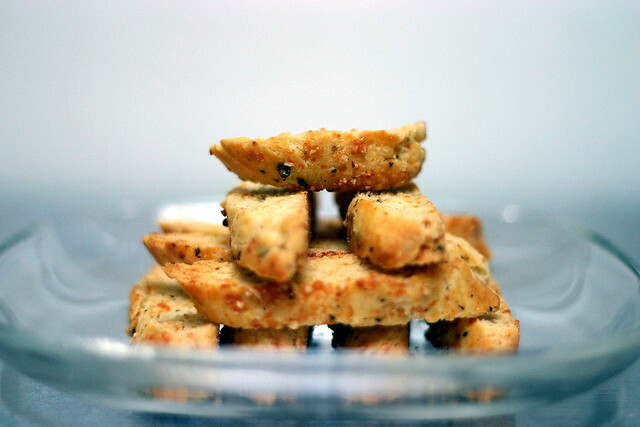 These ones, though… the recipe sounds as if they’d turn out just the same, but I can’t see myself dunking cheese cookies in a nice glass of Chianti! Help, please? Deb, anyone? How are they supposed to be eaten? Or do they turn out completely different? I’d love to make them for our Christmas dinner (my family, including me, is starting to get tired of all those sweet cookies…)! My house smells heavenly of Parmesan and Pepper!! I used Parmigiana-Reggiano cheese rather than regular parmesan…Not quite as sharp a flavour. Love the afterburn of the pepper…. Absolutely would not hesitate to dunk into a glass of red wine. Want to use Whole Wheat flour for my next batch…and perhaps even more cheese in the dough. I nearly doubled the amount of cheese called for in the recipe….but I’m a cheese freak, so more and different flavours would be fun to play with. Thanks, Deb, for your great ideas here! 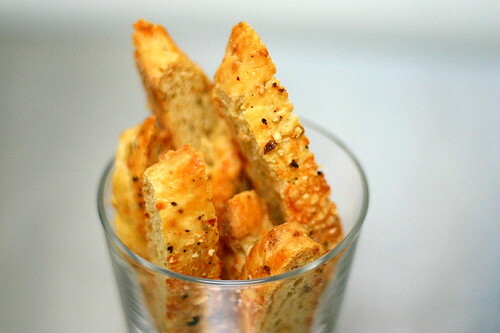 These biscotti are great when served with cocktails or sparkling white or rosé wine, vegetable antipasti or Mediterranean-flavored soups or salad. I;m excited to make these and am planning on serving them for a Thanksgiving appetizer but I was wondering about the rack spacing in the oven…do you rotate the trays between the upper and lower third? Hi Deb…I know many ask you about freezer or no freezer. I’d like to make these for a cocktail party that is in 2 weeks. Would you recommend baking them and freezing to preserve the freshness or do you think that they will be OK in a sealed container rather than in the freezer. I know that the recipe says they keep for two weeks but I am wondering how much of their freshness they lose. If you – or anyone that has made these – has any thoughts on this I’d really appreciate it. Thanks! I generally recommend the freezer over room temperature for freshness. There’s just less chance for them to “decay”. I have been all over the internet looking for something tasty to make as an appetizer for a dinner party I am having soon. These will be perfect! Thank you, I can’t wait to try them. Hii Deb, I wanted to ask you about the cheese, is it fresh Parmigiano or the one that is already grated you know like kraft or something? I usually grate my own; I think it has better flavor. If you can find real grated Parmesan with no other ingredients in it, no reason not to use it instead. Quibble- These are delicious, but took an additonal HOUR of oven time over what was recommended in the recipe. My oven may be old and slow, but its not that slow and I think the initial cooking time should be closer to 45 minutes, instead of 30. Other than the baking frustration they are wonderful! I am going to spread a little home made pesto on them and bake for about 10 minutes tonight for a “fancy” hors d’oeuvres this evening. Thank you for the recipe. For months I’ve been following this website – the content is great and the comments from other users are very helpful. Given the rave reviews of these biscotti I just had to try them for a Christmas Eve party. They are amazing and such a nice treat with a glass of wine! But the one issue that I have is that they don’t remain dry biscotti (like sweet biscotti) – they get soft even when I store them for a couple of days in an air tight container. I let them cool completely before putting them in. I also tried to dry them out before serving them by putting them in the oven for 10 minutes. What happened? Or is this the way they are supposed to be? Tamaraleah — I’m not sure, huh. Mine stayed crisp but I had them in a tin so it was not fully airtight. However, most things soften a bit at room temperature in airtight containers, especially cookies, which these are closest to in formula. I made these for appetizers for our big Italian Christmas. (We’re not Italian, we do a different cuisine every year). They were terrific! We had homemade Lemoncello and the pepper bite was perfect with it. As it was the red wine. This goes into the permanent file. Thanx! Hi Deb! These look fantastic! I currently do not own a spice/coffee grinder (on my Christmas list!). Can I just use fresh ground pepper? Yup! Leave some more coarse if you’d like. This is a strange question, but I don’t have access to whole milk where I am. I have access to that distilled, demi-creme milk. A lot of the baked recipes I want to try on your site call for whole milk-I’ve been skipping these recipes mainly, but do you recommend any alternatives? So many of them (such as this one) seem delicious-I don’t know what’s best to substitute-soy milk, almond milk, coconut milk…? the former don’t have a comparable fat content to whole milk, and the latter has a distinct coconut flavor that I don’t want to compromise the taste too much with. Should I just stick to the tried and true recipes that don’t call for milk?… or is it worth experimenting? Hi Rebekah — I am unfamiliar with distilled, demi-creme milk. Can you tell me more about it? There isn’t a hard and fast rule for substituting other things for milk; it’s best to go on a recipe-by-recipe basis. In many cases, using authentic milk isn’t as important as it seems. In others, such as a custard, things that are not real milk can be trickier. I suspect that almond milk might work here. It might even be fun to play with using a portion of wine instead of the milk; I think here it’s more about using a tasty liquid than the aspects that milk proteins provide. Deb, I have a question regarding the gruyere, rosemary sea salt crisps. Dough was too dry and didn’t hold together to roll out. What do you suggest? I followed recipe. Looked like someone else mentioned adding an egg, I am not sure this is right, water? Pled advise. They are great but need your help! Grace — I’m sorry they didn’t come together for you. Two tricks: make sure you’re very lightly packing your flour measurements (spoon and sweep). Also, the instructions would be better off if they said “Run the machine until the dough comes together.” This could be another 30 seconds, but it will. (Promise.) If you’re still having trouble, use a tablespoon less flour next time. I wouldn’t add an egg, personally. oh-my-heavens, made a 1/2 batch of these and they are so good. Now I know why ancient Rome went bankrupt buying all that black pepper from India!!! I made these to go with my homed chutneys and chilli jellies as Christmas presents, and don’t want to give them away now I’ve tasted them. I had an extra egg in, as I didn’t read the recipe properly, and used pecorino instead of parmesan – still great. Fab blog Deb, I could lose hours in your recipes. Your work is beautiful, your obsession admirable! Yeah, I found it, knew you would have a savory biscotti recipe. The author of Aftertaste ( great novel by the way), served us a savory biscotti and had a cheese spread on top with a drizzle of fig jam( pairing sweet and savory). Could you suggest a recipe for this? She said you could use any jams or as Emma mentioned jellies or chutneys too. “Pulse peppercorns in grinder until coarsely ground.” What, serously? Now who doesn’t have a pepper grinder lol?! These look great. I’m going to be attempting a gluten-free version with soy milk. Will let you know how they come out. it’s because its a very large quantity of pepper and you want it ground coarser than a pepper mill will give you. Grinding it too fine will make the flavor much stronger, so if you use a pepper mill, use less pepper. Wondering what would happen if I substituted whole wheat pastry flour for the all purpose? I’m on a 3-week no white flour challenge and these are speaking to me. Cair — If making something for the first time, I usually recommend just a partial swap. I do think they’ll work either way, however. I made these this past weekend. Fantastic. Washed down with a light summer red. I keep checking your Instagram looking for news of the new arrival. I hope all goes well. Making these — and very excited to be doing so because they sound terrific — but I bought already-grated parm (just parm, no other ingredients) and 4 1/2 oz. measures about 1 1/4 cups. Yikes! Now what? When you grate the cheese, Deb, how finely are you grating it? It is powdery? I made this wonderful biscotti recipe for a Christmas Eve gathering. I grouped them with, cheese, cheese spreads and fresh fruit. I did add extra cheese and fresh basil between the baking. These are delicious and easy to make. I make these for our annual Christmas party, they’re a hit. To make them slightly more bite size I cut them straight across rather than diagonally. Wonderful with a glass of red wine! Thanks for this great recipe.